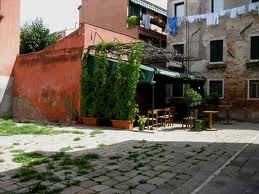 A new Osteria in the Cannaregio district! In early 20th cent. there were about 1290 Osterie -wine bars- in Venice, one for every 124 ihnabitants...... today much fewer than that, but some of them still keep the original mood and quality, such as the "Osteria alla Frasca", recently re-opened by Bruno Natural. This young owner and certified Sommelier had worked at many of the best restaurants in the city, and finally decided to start his own business, a small, pretty and old-style place dating from 1903 with 6 or 7 tables inside. The Osteria is located in a spacious and quiet courtyard at Cannaregio district, Corte della Carità #5176, with outdoor tables in spring-summer. The best dishes are seasonal and fish based, prepared on the spot, seasoned with fresh herbs or slightly spiced, on order to enhance the natural flavour of the ingredients. I suggest to try the mixed Venetian fish platter, Seafood spaghetti, the baked Sea bass or Seas Bream with Artichoke sauce, the Chocolate Tart or the traditional Tiramisu, with such a soft mascarpone cream..... can't wait to go back!